Heat oven to 375°F. In medium bowl, stir sugar cookie mix, butter, egg and cream of tartar until soft dough forms. In a small bowl, mix cinnamon and sugar. Shape dough into 36 (1-inch) balls. Coat balls with the cinnamon-sugar mixture; place on baking sheet. Bake 7 to 9 minutes or just until cookies are just set. Watch them closely! You don’t want them crispy, browned, and over baked. Remove from baking sheet to cooling rack. Cool completely, about 15 minutes. For each sandwich cookie, spread frosting on bottom of 1 cooled cookie. Top with second cookie, bottom side down; gently press cookies together. 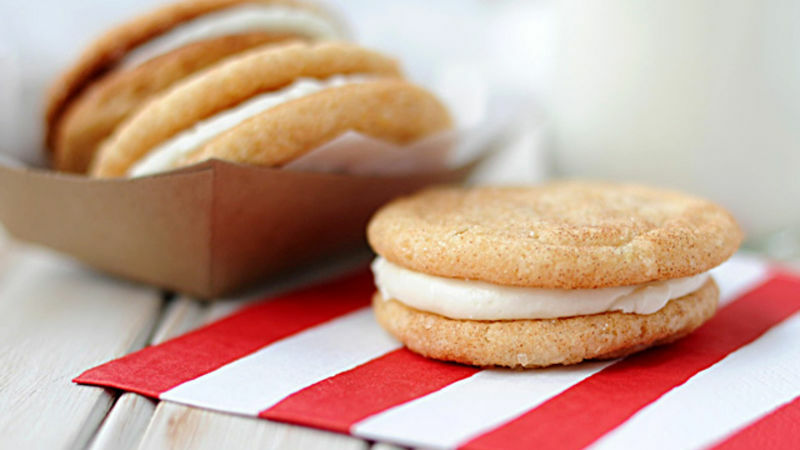 Cream of tartar gives Snickerdoodles their traditional “cracked” exterior. If you don’t have cream of tartar in your pantry, no worries! Omit it from the recipe and it will still taste divine!